Selecting the best countertop material for your bathroom or kitchen is a complicated task. Finalizing the ideal countertop with all of the options available on the market (like marble, granite, glass, steel, bamboo, faux-granite etc.) is a big challenge. Among all countertop materials, silestone countertops are popping out as the popular countertop material choice because of its stain resistant quality. Silestone is a manmade countertop material. It is manufactured from quartz. This countertop comes in oodles of color tones, finishes and styles for kitchen and bathroom treatments, matching many home styles. Silestone is made from quartz crystals. Quartz is already a popular material for manufacturing of sinks, shower trays, floors, wall cladding and countertops. Silestone has inherited a lot of qualities of quartz. Silestone is durable and non-porous in nature. This material is hard and resistant to stains, scratches and bacteria. Silestone countertops are easy to maintain and customize. You can achieve a high-end finish without the providing high-end maintenance. Many existing users of quartz countertops are opting for silestone countertops for their bathrooms and kitchens. Kitchen is the heart of home. You want your kitchen to not only look good, but working inside the kitchen should be easy. And kitchen countertop plays an important role in the overall look and feel of the kitchen. Silestone can be a good choice for kitchen countertop surface. No matter what is the size and shape of your kitchen, there is a Silestone countertop for you. Your countertop, floors, sink and even walls can be made with Silestone. No space is too big or too small. Silestone countertop can enhance the beauty of your kitchen and make the countertop as the focal point of the kitchen. Silestone countertops are available in a lot of contemporary designs that provide modern look and feel to your kitchen. You can select color, design, shape and size as per your needs and requirements. When it comes to bathrooms, silestone is not as popular as it is popular for kitchens. Still, many homeowners prefer silestone for bathroom vanity top installation. It is mainly because of availability of this material in oodles of colors and designs. It enhances the beauty of bathroom décor as well. If you want to make your bathroom look fancy, you can also opt for the silestone countertop. Granite is beautiful and durable countertop material, which makes it the first choice for kitchen countertops. Granite countertops have many advantages and this is the reason behind their popularity. One of the major benefits of granite is they do not lose value with time. 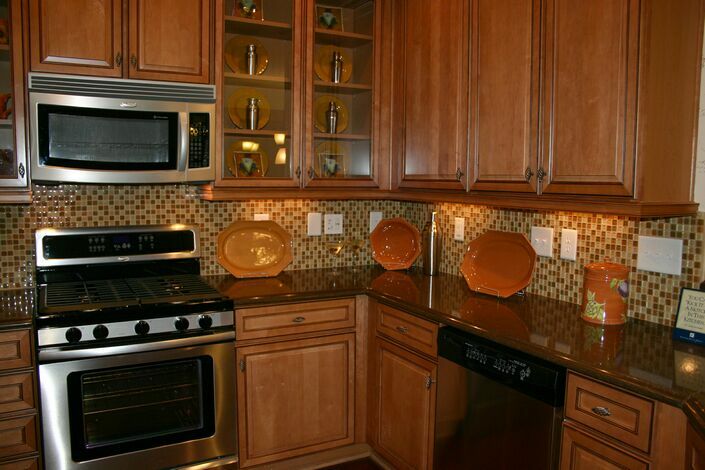 In fact, granite countertops can increase the value of your home. This material provides natural, unique, luminous surface. 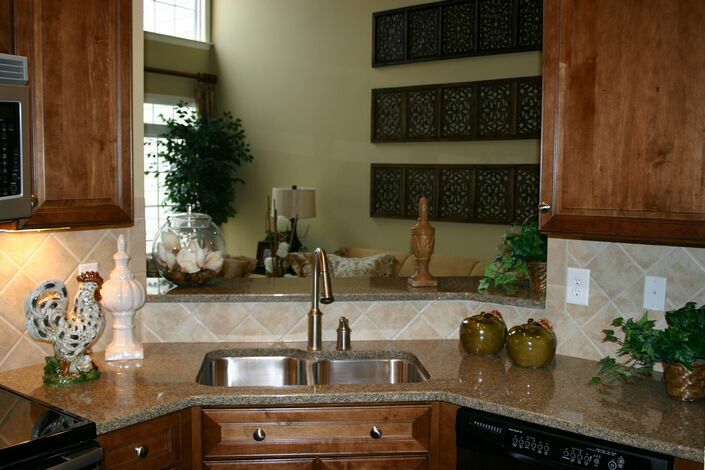 When it comes to hygiene, granite is better than other countertop materials. This material does not get affected by the bacteria contamination. And it can be easily cleaned using warm water and cloth. However, granite is not completely resistant to the abrasion caused by daily kitchen use. Thus, granite countertops require sealing to resist dirt and spills. Granite sealing will cause liquids to drop on the surface. Thus, stone does not absorb the stains. This is especially helpful if you have light-colored countertops. Cleaning the spills from the sealed granite countertop is easier than unsealed granite countertops. Sealed surfaces are smooth and you don’t harm the granite when you clean the countertop surface. Sealing will reduce harm caused by acidic substances and cleaning agents to the countertop. It is not easy to remove the stains of acidic substances from the unsealed granite countertop, but if you have sealing, stain removal becomes easy. Sealing substance can make cleaning the countertop surface much faster. Dirt and fingerprints can be easily wiped up. Since liquids will spread on surface and will not be absorbed into the granite, it will be much easier to clean without any scrubbing. This reduces the cleaning effort and cleaning cost to a great extent. The biggest advantage of getting granite countertop sealed is that sealant will help you to preserve the natural beauty of granite. It means your granite will never look lifeless or dull. If you ever feel like your granite countertop is losing its shine, you can reapply the sealing. However, you should hire a reputable and trustworthy granite contractor for sealing the countertop. They will use good quality sealant and know how to apply sealant adequately on the granite surface. What are the most common bathroom countertop materials? 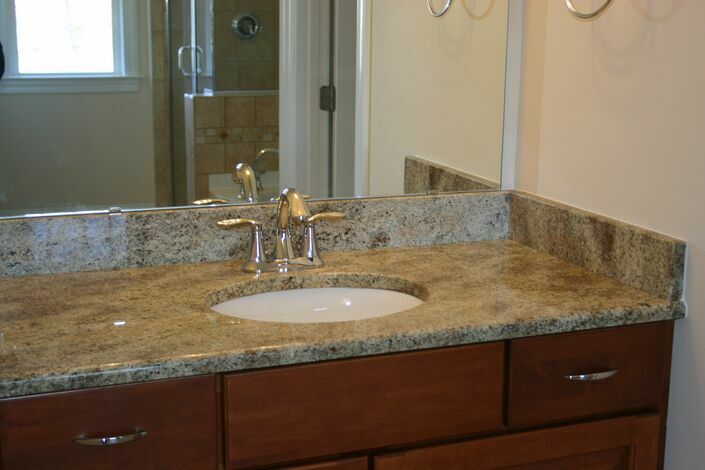 Are you thinking of installing a new bathroom countertop? There are virtually limitless countertop options to consider! When it comes to bathroom countertops, some of the most common choices among homeowners in your area include granite countertops, marble countertops and soapstone countertops. These countertop materials are highly durable and can get continuously wet without causing any damage! When you work with a professional countertop contractor, you have the benefit of years of experience on your side. Take a look through your countertop repair contractor’s portfolio to get more ideas for your new bathroom countertops! Some other popular countertop options for the bathroom include quartz countertops, solid surface countertops and recycled glass countertops. There are also several eco friendly countertop options for homeowners who are concerned with lessening their impact on the environment! Before you choose a countertop expert to work with, be sure you find someone with at least ten years of experience installing countertops and repairing countertops. You might be able to get a deal on several countertop options if you decide to install new bathroom and kitchen countertops at the same time! Butcher block countertops, slate countertops and glass countertops are all great choices for your modern kitchen. What should I use to build my kitchen countertops? Are you thinking of installing new kitchen countertops? There are virtually endless countertop options to consider! 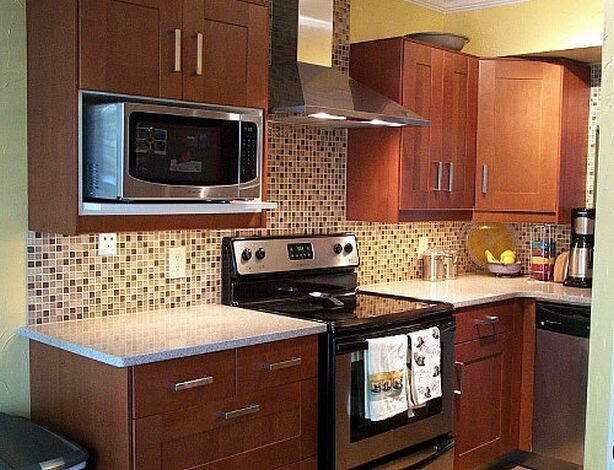 Most modern kitchens and traditional kitchen designs include some kind of granite countertops. Granite is an extremely popular kitchen countertop material because is it pleasing to the eye, easy to clean and not easily marked by kitchen knives and other utensils. Some other great countertop options for the kitchen include solid surface countertops, recycled glass countertops, quartz countertops and aluminum countertops. You can even install a separate butcher block countertop so you can chop and cook meat away from the rest of your food. More and more homeowners are becoming interested in eco friendly countertop options to help lower their impacts on the environment! Recycled countertop materials can look just as new and and just as pliable as brand new countertops. We recommend working with a professional countertop contractor to find the best and cheapest eco friendly countertop materials in your area. There are often discount countertop options available as well whether you are looking for LEED certified green countertops or other choices such as soapstone countertops and marble countertops. Once your new kitchen countertop is installed, countertop resurfacing services may be needed every few years. How much will it cost to replace my quartz countertops? Has it been years since your last countertop installation? It may be time for an upgrade. The Countertop Factory provides a nearly endless selection of different kitchen countertops and bathroom countertops! One of our experienced countertop contractors would be happy to help you select the most durable countertop materials for your kitchen or bathroom. We can even help to come up with a new countertop design that matches your existing home décor perfectly. One great idea is to install matching his and hers bathroom vanities so you can both use the bathroom counter at the same time! A few of our favorite materials to use in the bathroom include soapstone countertops, marble countertops and granite countertops. These countertops materials are impervious to moisture, so they are very durable for bathroom use. If you are more interested in types of countertops for the kitchen, we can help you out there as well. We tend to favor solid surface countertops in the kitchen; your home countertop contractor can recommend the best countertop brands out there! Installing new home countertops is a great way to add a new dash of style to your home while increasing its market value! Is granite or quartz a longer lasting countertop material? Many homeowners constantly struggle with the question; which countertop materials are the most durable? The Countertop Factory can help you find the best countertops for your home based on a variety of factors such as your countertop budget and the home décor of your bathroom or kitchen. Granite countertops tend to be the most popular option for homeowners whether they are looking for kitchen countertops or bathroom countertops. However, quartz countertops come in a close second and are just about as durable as their granite counterparts! An experienced countertop contractor will be able to recommend the best countertops for your home based on your personal styling wishes. The best part about granite is that it is extremely easy to clean. When you’ve got granite kitchen countertops or granite bathroom countertops, countertop cleaning will be a breeze! However, there are tons of great countertop options out there aside from just granite and quartz! Some of our other favorite countertop options for the home include soapstone countertops, tile countertops, butcher block countertops, solid surface countertops and recycled glass countertops. The right set of home countertops can truly make or break any kitchen or bathroom! What are the best countertop materials for a bathroom? There are a plethora of options to consider when installing new bathroom countertops. The Countertop Factory offers a wide range of both traditional countertop designs as well as more modern ones. Some of the most traditional countertop options for bathrooms everywhere include marble countertops, granite countertops, soapstone countertops and slate countertops. Some other ideas include limestone countertops, Corian countertops, recycled glass countertops and wood countertops! Our team of experienced countertop contractors can help you decide which countertop materials are the best for your home based on your present home design and countertop budget. Whether you’re looking for new bathroom or kitchen countertops, we are here for you! Solid surface countertops are a great option when it comes to new countertops for the bathroom. We offer a wide range of countertop brands that have been tested and approved by thousands of our customers. We sometimes offer discount countertop options for our local customers, so be sure to inquire with a countertop installation contractor today! We can help you completely transform your bathroom or kitchen into a beautiful oasis complete with gorgeous new quartz countertops or glass countertops! Don’t wait to long to schedule a countertop consultation. We can’t wait to work with you. How can I seal my granite countertops? If you’re looking for high quality kitchen countertop repairs or resealing, you are in the right place. The Countertop Factory specializes in all varieties of kitchen and bathroom countertops! Granite countertops are by far our top seller; however, there are virtually endless countertop options from which to choose. If you’re planning on a countertop replacement service, it’s best to know all about the different countertop materials that are available to you. We offer many varieties of solid surface countertops, including Corian countertops, Formica countertops and Silestone countertops. These materials are extremely durable and will last for years to come. Looking for recommendations on which countertops to install in your kitchen or bathroom? Our countertop contractors would be more than happy to help. For the bathroom, we highly recommend soapstone countertops, quartz countertops or tile countertops. Tile is the best option since water will frequently be touching the countertops. As for the kitchen, our top recommendations include glass countertops, wood countertops and marble countertops. We sometimes offer discount countertops opportunities to all of our local customers, so be sure not to miss out! At our countertop shop, you will find just the right countertop material and countertop styles to suit your every day household needs. How much does countertop resurfacing cost? All granite countertops and quartz countertops need a little touch up every now and then! No matter how high quality your countertop materials are, they are bound to get at least a little scuffed up after months or years of regular use. At The Countertop Factory, we provide complete countertop maintenance and countertop repair services! That includes countertop resurfacing for a low, affordable price. We repair and resurface tons of kitchen countertops and bathroom countertops on a daily basis throughout North Carolina. We can even install brand new solid surface countertops in your home if you need them! It’s easy to get lost in our sea of endless countertop options! We’d be happy to make countertop recommendations to you based on your needs and budget. We highly recommend laminate countertops, soapstone countertops, silestone countertops and recycled glass countertops for the bathroom. On the other hand, some truly great choices for the kitchen include marble countertops, Corian countertops, tile countertops, wood countertops and recycled glass countertops. Whichever style you choose, you won’t regret it! New countertops can make or break any kitchen or bathroom, so it’s important to be absolutely sure of the countertop style you select. Your brand new kitchen or bathroom awaits you!